On January 20, the New York Times carried what they at first thought was a scoop on a “classified” report (pdf) on Afghan military and police personnel killing NATO forces. After they were told that the Wall Street Journal had written on the report back in June, they admitted as much in a correction. They later added another correction after I pointed out that a version of the report clearly marked “unclassified” could be found easily even though the Times referred to the report as classified. It turns out that the report had indeed been published first as unclassified but then was retroactively classified while the Wall Street Journal article was being prepared. Events over the last few days serve to demonstrate the folly of trying to hide damaging information rather than openly reviewing it and trying to learn lessons from it. 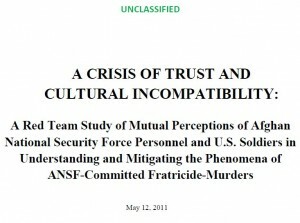 The report in question went into great detail to document the cultural misunderstandings that exist between NATO forces and their “partner” Afghan forces, and how these misunderstandings escalate to the point that Afghan personnel end up killing NATO personnel. In the executive summary of the report, we learn that “ANSF members identified numerous social, cultural and operational grievances they have with U.S. soldiers.” Arrogance on the part of U.S. soldiers often was cited, as well. Afghanistan’s interior ministry has said one of its own employees is suspected of the killing of two senior US Nato officers inside the ministry. Officials earlier named police intelligence officer Abdul Saboor from Parwan province as the main suspect behind Saturday’s attack. Nato withdrew all its personnel from Afghan ministries after the shooting.